Quizzity is a fun and easy geography game that you and your students can play! 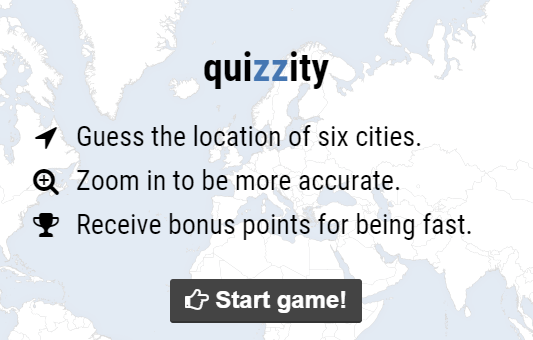 In Quizzity, you are given the name of a city and then you have to click on the map on where you think that city is located. The closer you are to the city's exact location, the more points you will earn! As the end of year approaches, you may find the need to backup your files and folders on your teacher computer. We have created a checklist of backup recommendations for you to review. On the checklist, directions on how to complete each backup process are linked within the document. For other information on completing report cards such as inserting comments, visit the Elementary PowerTeacher website. If you have any questions about finalizing report cards for T6, S2 and F1, please contact me or your school's PowerTeacher representative. Chromebooks are coming for 3-5 students! If you did not know or have not been a part of the Chromebook Introduction trainings, students in grades 3-5 will be receiving Chromebooks next year to use during class. Unlike middle and high school students, these Chromebooks will remain at school. Watch the video below to see and hear the experiences of an elementary classroom.